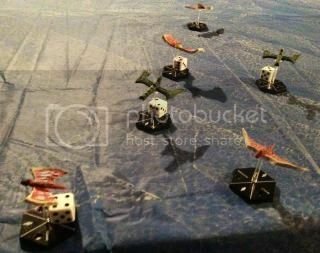 A swarm of Tyranid bio-constructs was traveling across the Sea of Sorrow on a patrol for bio-mass. They were approaching the Harkmaann's Fisheries. 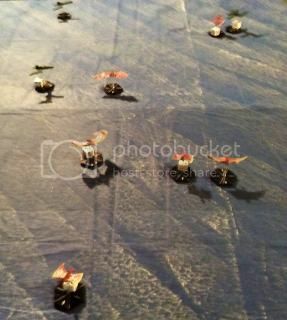 However, a patrol of Dark Eldar Raven's decided to indulge in a bit of sport and attacked the Tyranids from behind. My wife was interested in the Tyranid swarm because they were pink. However, I advised her that they were slow and I had no idea how competitive they were and that I wanted to test them out. She agreed to and told me she wanted to fly the Dark Eldar against them. Well, this should be a HUGE challenge. 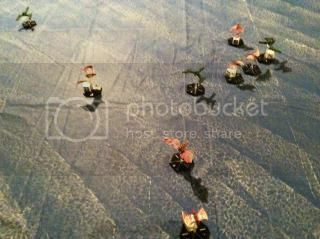 Per the rules for Bandits of the Karsundi River, the Tyranids were placed in the center of the board heading South. The Hags were at Altitude 6, and the Virago were at Altitude 7. They were at speed 3. 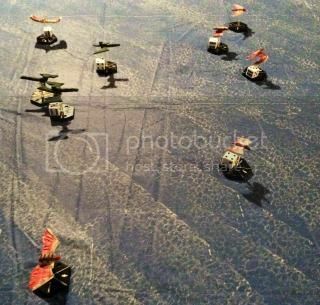 The Dark Eldar Ravens came in on the North board edge at full speed and staggered high altitudes. There is no way the Tyranids can outrun their pursuers and they are caught in the open over the ocean. This will be a huge test for the Nids. My plan is to use the Hags to try and lure the Dark Eldar Ravens into predictable attack lanes, and use the Very High maneuverability of the Virago to get a shot at them. They only have 1 hit after all.... and a Shadow fields. Gulp. Initiative: Per the rules the Dark Eldar get initiative. The Dark Eldar raced in at max speed! Dang they are fast. The Tyranids try to scatter but the abilities of the Ravens still leave many of them in danger. Raven 3 took a snap shot at Virago 1 with his Dark Lance, but missed. Everyone else was out of range. The Dark Eldar race forward. Raven 2 gets a bead on Hag 3 as it tries to scramble away. Raven 3 drops low to snag any potential power dives, while Raven 1 spirals and goes high to protect the rear. Meanwhile, the Hags just scramble to stay out of the way. I'm honestly not sure if they will be able to turn around before the board edge or if they will simply disengage. 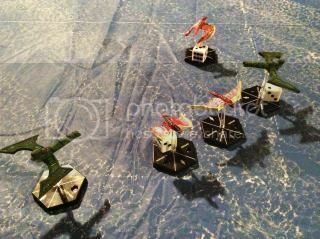 Virago 1 takes a High G turn to parallel the attacking Dark Eldar. Virago 1 spirals back into the action and gains altitude. This will give him a shot at Raven 1. The outnumbering is helping so far. I can see exactly where the DE will end up before moving my Virago. Raven 2 opens fire at Hag 3, but misses completely. Virago 2 fires on Raven 1 with his Devourers. The Devourer beetles bounce harmlessly off the Raven's armor, their kinetic energy spent. The Dark Eldar try to pin down the Hags fleeing to the East. However, despite being close, they are at the wrong altitude to intercept. The hags' are at their Max Altitude of 7 while Raven 2 and 3 are at 5. Raven 3 is attempting to get into position and is way outside the furball. Virago 1 and 2 and attempting to home in on Raven 3, but only Virago 2 has the angle. Raven 2 takes a long range Dark Lance shot at Virago 2 and hits! The shot sears across bone and sinews and the Virago's body begins to drip ichor and tissue. The damage causes Virago 2 to miss his shots on Raven 3. Hag 3 tries to avoid the oncoming Raven 1, but Raven 2 races ahead of him and spirals into close range. The other Hags continue to scatter, but it is unclear if Hag 4 will be able to turn enough to stay on the board. Raven 2 spirals into the center of the action and forces the Virago to scatter away from his guns. The Tyranids have the initiative so Hag 3 fires on Raven 3. The Hag has its most firepower at close range, so maybe he has a chance? 2 Hits, but no damage. Raven 3 returns the favor and blasts the Hag out of the sky with Splinter and Dark Lance fire. First blood to the Dark Eldar! Only three more to go! The remaining Hags try to swing around and stay on the board, while the Dark Eldar try to swoop in behind. Virago 2 comes about and is heading straight for Raven 2, while Virago 1 spirals and swoops down onto Raven 1. Virago 2 fires a burst of Devourers at Raven 2, but the Dark Eldar craft flies right through with no damage. In return, Raven 2 targets Hag 2 and opens fire. The Dark Lance sears right through Hag 2 and the creature plummets from the sky. Virago 1 peppers Raven 1 as it closes in and for a rake attack. The Devourer beetles all fly wide of the mark. The talons get two solid hits, but fail to cause any serious damage. That was probably my best chance to take out a Raven and I just blew it. Raven 3 targets Virago 2 and opens fire. The splinter cannons fail to find their mark, while expending the last of his Dark Lance ammo for no effect. Virago 1 fires on Raven 1 with Tailing Fire. The Devourers miss, but the Talons get two solid striking hits. However, the Ravens Night Shield deflects the blows. Dang it! 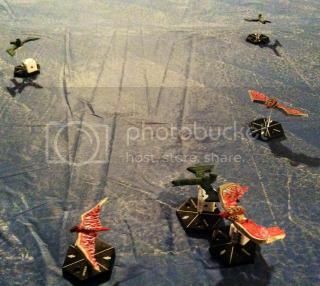 The two Hags skate the edge of the board and avoid disengaging while Raven 2 and 3 leisurely fall into firing positions. Virago 2 moves to attack Raven 2 and Virago 1 tries to catch up with Raven 3. Raven 1 is content to spiral and shake the Virago that was attacking him. Virago 2 fires the last of his living ammo at Raven 2, but misses all of his shots. Raven 2 fires on Hag 4 and blasts him from the sky. Virago 1 takes a mid-range desperate shot at Raven 3 and hits twice! However, he fails to cause any damage. Raven 3 is out of Dark Lance ammo so fires his Splinter Cannons at Hag 1 but misses. Raven 1 spirals and races back towards the fray, looking to get a kill. Hag 1 traces the edge of the board while Raven 3 follows slowly behind. 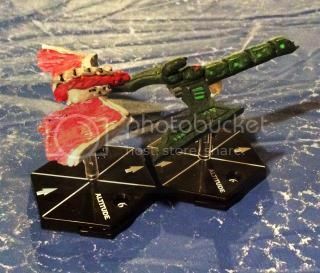 Virago 2, out of ammo, dives onto the pursuing Raven 3 for a claw attack! Virago 1 tries to get an angle on Raven 3 as well. Raven 2 breaks hard away and rockets away from the action. Raven 3 fires the last of his ammo on Hag 1. He hits but fails to finish off the critter! Virago 1 uses the last of his ammo to attack Raven 3, but misses. Raven 1 coming up from behind fires on Virago 1. The Dark Lances blasts a deep wound across the Viragos body. Now both have been injured. Virago 2 attacks Raven 3 with his Talons. He gets two damaging Hits and the Night Field saves 1. 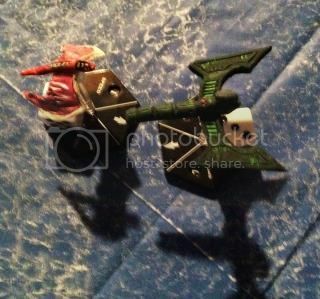 The Viragos blade slices through the cockpit and decapitates the Dark Eldar pilot! 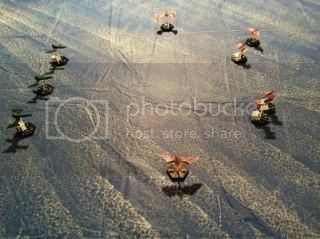 The Tyranids disengage off the board while the Dark Eldar move in for the final kill. Well, my plan almost worked! The Hags were nice fat and slow targets that the Dark Eldar couldn't resist going for. Due to the outnumbering, they were the only targets she could reliably get a bead on. That allowed my Virago to move into attack. The Virago's slow movement wasn't terrible. It actually helped them get into position for Talon attacks. However, the Low maneuver of the Hags was a huge problem. They could barely stay on the board. However, they are low cost and ensure you can outnumber your foes and gain an advantage that way. It didn't necessarily feel like it, but the game was relatively close. The Dark Eldar were downing my low points craft, so even destroying one of theirs was equal to two of my Hags. However, in the final analysis, the Dark Eldar won this round! Where do the Tyranid rules come from? Are they an 'official' thing, or fan made? Are they generally well balanced? Where did you get their models? Does the list of 'Nid flyers include things like Harridans, Harpies and Crones? There seems to be a lot of time with little action (many failed shots, failed damage rolls, inability to shoot, etc.). Does that get frustrating? Where do the Tyranid rules come from? Are they an 'official' thing, or fan made? Are they generally well balanced?- They come from the Curse of the White Wyrm campaign book from the Airspace forum. They are also found in the Airspace Compilation. Hard to say how balanced they are since they are fan-made rules. However, a lot can depend on the scenario. Where did you get their models?- I made them/scratchbuilt them. Does the list of 'Nid flyers include things like Harridans, Harpies and Crones?- It has Harridans, Harpies, Spore Mines, Exocrines, and gargoyle swarms.... oh my! I wouldn't be surprised if future campaigns have more Tyranid critters. There seems to be a lot of time with little action (many failed shots, failed damage rolls, inability to shoot, etc.). Does that get frustrating? - Well, like most wargames it is all about maximizing your probabilities. However, there is an added dimension (literally) with altitude. 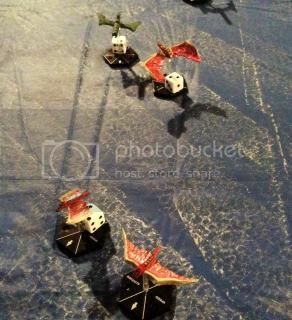 For this report, I had never used Tyranids so there was still a lot of figuring out how to maximize their probabilities. If you download the Airspace Compilation they just added three new Bugs.